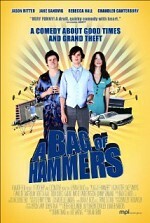 Watch A Bag of Hammers: Two car thieving buddies (Ben and Alan) come to personal crossroads when Kelsey, a likable but neglected and fairly well abandoned twelve-year-old boy, crosses their path. Ben and Alan, having bonded for life in helping each other escape unhappy home lives, react differently to Kelsey's situation. One deeply fears the responsibility of looking after a child (having had no personal experiences worth following) while the other finds himself compelled to take him in (seeing himself in the child - an abandoned kid whom no one else wants).